Cadet Life at Army and Navy Academy works to develop young men of character with year-round reinforcement of our Academy values of leadership, honor, integrity, respect, responsibility and compassion. Boys thrive in environments where there is a structure and concrete life lessons, places where a code of conduct is clearly defined. The honor code, honor council, and merit system serve to recognize the positive and reinforce self-responsibility and accountability. 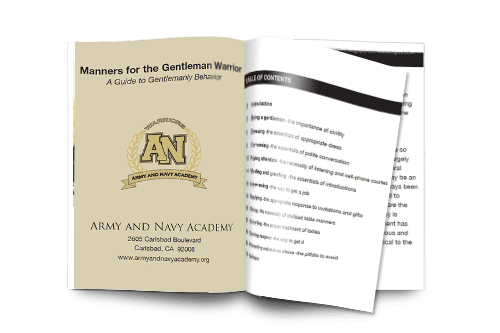 The military component provides hierarchy and rites of passage, habit and structure, better personal appearance, peer leadership, and mentoring – all in a boy-centered environment. Rules and standards are a boy’s friend, not his enemy, so long as they are presented as methods of conduct that promote success and not rigidity. Boys crave structure, hierarchy, and order, and if you think otherwise, watch them play. They set boundaries, play positions, and they move as a team. They run plays, they know their assignment and they know how to help. Structure does not strip them of creativity, it creates unity and bonding, so boys are naturally drawn toward it. The Cadet Life team of Trainers, Advisors, and Health Professionals are responsible for all time outside of the classroom. They're all armed with an understanding of how boys learn, and apply Gurian Model principles in all that they do. The structure is based on the traditional Junior Reserve Officer Training Commission (JROTC) curriculum and a military formation called the Corps of Cadets. The majority of seniors reside in the Headquarters Company Cottages, while West Fagen Hall (commonly known as “The Palace”) houses the Battalion Staff. The Battalion Staff consists of senior Cadets who have earned the highest ranking leadership positions within the Corps of Cadets. Each company has its own unique network of Cadet Leaders who have completed extensive training in leadership and character development. These leaders, along with the TACs, help guide the lower-ranking Cadets in their journey to becoming young men of good character. Within each company are hand-selected Cadets from the High School who serve as Cadet Leaders. These leaders are trained by the TACs, in direct relation to our Cadet Life program. They learn age-specific behavior, peer counseling, and mentoring techniques, as well as ways to deal with everyday Cadet Life incidents. Cadet Leaders receive specific job descriptions, but most treat the experience more like being a big brother to the younger cadets. The western tip of the Academy’s campus has clear views of the beachfront and surf. Crean Hall houses Echo Company and consists of eight quads. Atkinson Hall is made up of four quads with four rooms to each quad. Lewis and McIntosh Halls encompass two buildings with eight rooms each. Two Cadets are assigned to each room, with two Cadet Leaders assigned to each quad. It is the Cadet Leaders' responsibility and goal to convey ownership of their area to the other Cadets. Each Cadet is assigned a specific responsibility in maintaining a clean and orderly room. From day one, Cadets learn to work as a team. Interested in viewing or downloading photos from our school events? Check them out at Randel Berg Photography's website!